These Jottings may seem obvious, and clearly they're the rude scratchings of a rank beginner. But we have to realize that when I learned them, they were new to me. Credo: I think the process of learning Go, what we learn, when, is as interesting and important to the overall game as game-specific concepts. It's good to look at a comment I added below, at . on any footnotes in the 100's. Move 106: The invasion is dead in gote? This is why the Star Points or 4-4 Point are nice to start with, but don't by themselves establish territory. Always look for the biggest point you can play, or, look for your opponent's biggest point and play there. Now, I have to learn the difference between an urgent point, and a vital point. When attacking a group, don't touch the enemy stone at first. That merely strengthens him. OK, I still don't fully understand why they are bad, but I still try to avoid them. Crimson: Empty Triangles are bad for many reasons. The list starts with a wasted stone which connects two stones that can't be separated anyway, and would be better placed to form the CatsFace, which is lighter, connected better and has more eye potential. Oryx: Many thanks Crimson! It's now three months after I wrote this jotting, and I think I can comfortably say that I do understand why the empty triangle is bad. In most cases: see GoodEmptyTriangle for the exception to the rule. Crimson: Also, empty triangles are heavy, and lack liberties in close fighting. Compare liberties with three stones in a row. Here, the two shapes have the same number of liberties, even though the lower one (the Farmer's Hat) contains one more stone. This is because of the two empty triangles. Oryx: As is more fully explained in A Static Treatise on Shape, an extension of a bad shape is more bad shape. Oryx: This can get to absurd lengths; in general, a blob of stones clumped together is either a waste of perfectly good moves that could have been out establishing moyo, or else it's the beginning of some Go parody (see the terrifying B2Bomber, or the famous treatise, "Get Strong At Empty Triangle"). Actually, Empty Triangles are GOOD! When you see your opponent making them, you can sit back, and thank him for the free sente he just gave you, and go invade some of his loosely-held territory. If I understood Ms. Guo correctly, then at this point B should extend his strong wall towards the Star Point at . This would be even more important if B had territory in the upper right corner. This one's from Lynx, a player at KGS. Lynx pointed out that my seemingly live white group along the side here is really dead -- because while B invades, I can only defend one side at a time. 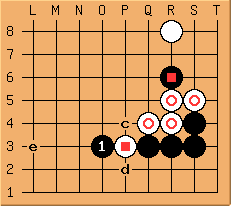 After , (a) and (b) are miai, and white dies. Painfully. So it goes. Lynx: I'm not sure if it is dead, but it is clearly very weak. Perhaps a Dan could look at this and sort it all out? Alex Weldon: The diagram doesn't really show enough to say whether it lives or dies. Depends on what's going on above. 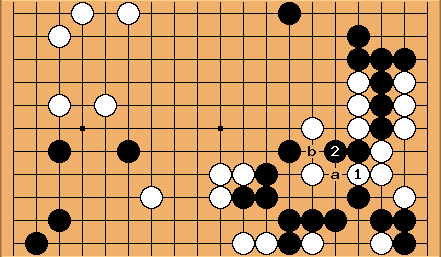 is weak, so if W has friends nearby to connect to, he can likely live or escape with c. Note that c gives B the option to double-hane which can lead to ko, or W giving up his group for a ponnuki on the outside, among other possible results. Oryx: As I recall, I had nothing close to connect to (top line in diagram added after Alex Weldon's comment). But you raise a very important point, that we high-kyu players too often forget: things always go better with some friends around. 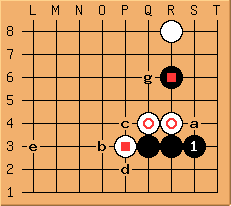 tderz: In this diagram, White would be dead without ko, = A, = E.
then this isn't anymore a flower-ko for Black as also separation white G is threatening. Because of these complications I estimate this a very game-depending problem. W can be forced to live by crawling. From a teaching game with czarny, a 7K player at KGS. We are at the very start of the game, four innocent moves, nothing special... then Black decides to look hungrily at White's lower right corner. White doesn't feel terribly threatened, and tries to isolate with ... only to see invade at the 3-3 point at the very start of the game! They exchange a move each, then White grins with avaricious glee: and hanes at ! AH HAH, he says to himself, Black's a goner here! The black cut c now leads to similar outcomes as with the descent variation. White has committed aji-keshi with this exchange, lost the attacking aji at f and one ko threat. The price of playing hamete (might look small but is decisive in even games). I only played the descent variation in handicap games. Black extends at , which draws to block; Black cuts with , White atari... ending with Black atari on , and suddenly, because of the overriding presence of , the White group of - - is short of liberties. 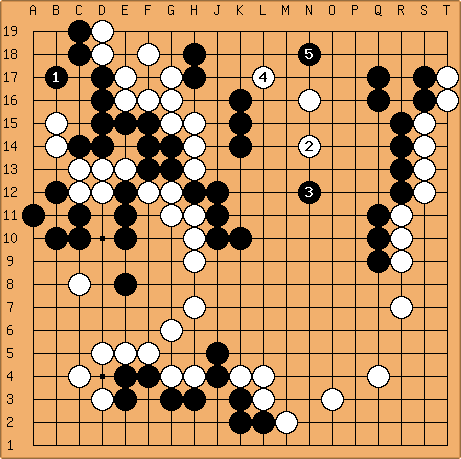 Black takes the corner, and White's in tatters. And all this, because White's unfortunate hane. [phantom] Interesting example... It seems a little specific to actually remember and apply to games, but I think it does a good job of making the point that other stones can really change 3-3 invasions. ThaddeusOlczyk Kogo describes the hane as a serious error for just this reason. It seems the hane is played out of a desire to kill the invading stone. One should always keep in mind that unless the proper steps were taken, 3-3 invasions should succeed. That is unless I am the one invading, in which case the invasion will fail. Oryx You might study the forthcoming pamphlets, Get Strong at San-San Failure and Winning Au Go Go: The 1-1 Invasion Strategy for more ideas on blowing a 3-3 Invasion. Rich: The best result I can see after this is for white to play in the original diagram as shown; there's still some aji there for later, though. White will have to take care in responding to a, black gets a big corner and could play at b for a nice thick shape along the lower side. 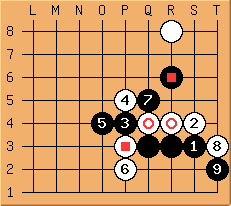 White is left with a small group and bad aji. Charles But see go bloopers. I wouldn't believe Kogo about anything tricky. The only attested pro example I know is Otake's hane-tsugi and cut. Bill: Through White is quite thick. (Compare this diagram with the ones where White responds to the 3-3 with the outside block.) Isn't this good for White? Suzuki and Kitani agree (Small Joseki Dictionary). At this point B is ahead by maybe 50 points or more. Ok, so he cuts at Q9. But can't W just kill this single stone off? What is TheCap thinking? Rich: W can't capture this stone. Oryx: shhhh... don't give away the ending! :) Some of us don't see it yet, not till we read through! W suspects something with this stone, or perhaps she figures it's small, and she needs to deal with larger matters first. The game progresses... it's still there, the easy kill. OK, so TheCap loses one measly stone. But why did he throw it away like that? Or did he? ... and suddenly a very nice 8-point or more profit garnered. Cute trap, if I do say so my [untutored!] self! Oryx: well, that's easy to say (and see) now, but beforehand, during the game, it was pretty amazin' to me. TheCap eventually went on to win the game, but not before macisajt showed her 7d strength, winning a cliffhanger of a semeai in the lower middle, winning back nearly 30 points for a 7.5 point final margin. One day hopefully I'll present that battle, and we'll see if, courtesy of 20-20 hindsight, TheCap could have pulled it off. ThaddeusOlczyk: Actually there is nothing surprising in this combination. Many kyu level players should see it. , and a and b are miai. 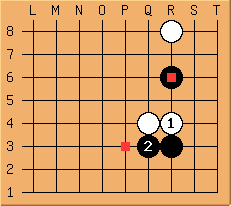 White plays one Black takes the other and the cutting stone escapes. The stones were captured way earlier in the game when Black played 8 and 10 in your sequence. Why White did not fight harder, I do not know, but understand that White did not feel they were worth saving. 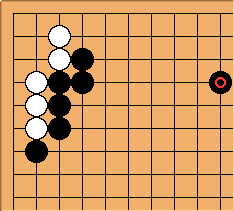 If one replaces one of the weak white stones with a black stone, Black would respond to 1 with 2. This is a difference of roughly 7 points for White. One says that the threat of reviving the dead white stones is aji, which White uses to gain 7 points. Bill: If Black played the reverse sente, he would gain points. White's sente play, however, is like cashing a check. In a sense, White is only making sure to get what is rightfully hers. See Sente gains nothing. He's very good at mutual capturing contests, races where both parties are enclosed, have at most one eye and are reducing each other's liberties, where the first one to put the opponent into atari and then capture their stones wins the race. Also, he has a good sense of local position play -- winning local fights. But he seems to lack a good strong opening. Ok, whether you agree or disagree, or like or dislike KenConan -- he seems to have his own set of detractors on KGS -- now at least I know what he meant! And by the way. 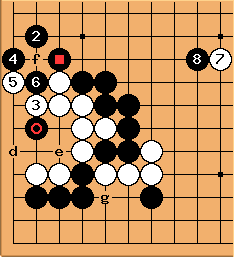 At THIS point in my Go career, looking up at a 5d like TheCap up there on Mt Yokahama or something, and having seen a couple of his other games... looks to me as if his style can be summed up as generally using many, many tesuji in the mid-game, eventually combining those seemingly small plays (like the Bait offered above) into sizable territory. Visiting Reader: As a Dan player, I find The Captain very entertaining to watch, but bad for kyu players (especially those weaker than 5kyu) to try and emulate. He has a very aggressive and greedy style which is full of overplays and is hard to learn from. The player on KGS I'd recommend most for kyu players (and Dans) to study is intetsu - he has a very patient, crystal-clear style and superb endgame. Makes a lot of honte moves, which is something everyone should try to emulate. Tderz: Everyone can learn something from better or evenly strong players. From TheCaptain we can thus learn good shape, tesuji, semeai and [L&D]. If TheCaptain were (even) better in fuseki, then he would be KGS 6dan or more. The so-called overplays belong to (t)his style - and create aji. They are overplays most probably only in the eyes of players with different styles. Just taking away these overplays leaves a style without its basis and would be comparable to the situation, where you give a calmer player the order to invade early, attack and kill where s/he is not prepared/experienced to do so. The result would be devastating. While being much weaker than the Captain - I can fully identify myself with his style - its stylish ^^. ThaddeusOlczyk: So who are DansToEmulate? Visiting Reader: IMHO, the classic Captain overplay is from greed, not to create aji. I have seen too many games where he has a big lead (which often comes after killing a large group) but throws it away after playing perilously deep into his opponents territory or moyo. A simple reduction would have sufficed but he tends to go all out and often has his invading groups perish (and/or his other groups or territories are damaged while the invading group tries to escape). When his invading groups live, it is impressive and entertaining but at the same time, it's not wise for kyu players to try and emulate. ilan from his comments on DansToEmulate: Actually, you should watch games of all styles, not necessarily to emulate them, but rather to learn how to deal with them. If you believe that TheCaptain's style is not necessarily sound, then you will learn a lot by trying to figure out how to refute it and compare this with the way his opponents deal with it. In particular, if you improve enough, you will have to play him at some point. The example here is from a game between myself and nakedjazz, a Japanese 20K player on KGS who beat the pants off of me the last time we played. I have a feeling we'll be playing each other many, many times in our Go careers. 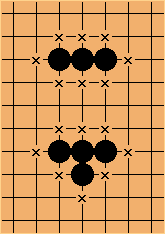 Obviously, the idea of using the "Knight's Move", or two stones separated by one vertical and two horizontal (or vice-versa) as an invasion technique is not my original invention!. I've seen in recently in several teaching games, and had it used against me a few times. What is new, is what is basic to this page, in that it is a technique that I've tried to learn and adopt. At this point I'd just blown a group on the middle left, but I had some nice area on the right and a bit on the lower middle left... so I thought I'd try invading. C0nfuseki: I personally think this invasion can be countered by Black hitting underneath at Square. 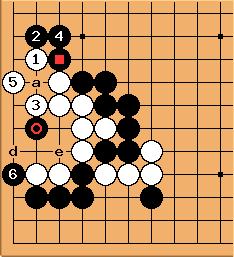 But more importantly, I think Black can both save the corner and threaten the White group by playing a nice move like Circle instead. 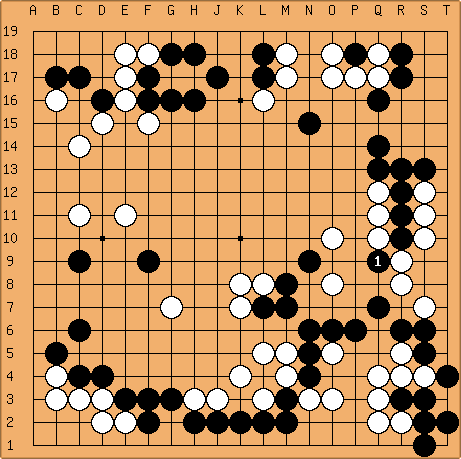 This allows for Black play at a to kill the White group. symplicity: I would agree that the circle or thereabouts looks pretty large right now, though I'm not sure how a kills white afterward. Anyways I agree, this invasion should not live. 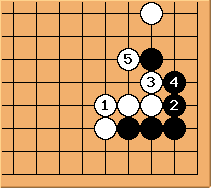 In fact, I'm not even convinced white can live if black ignores it, since black is so ridiculously thick all around. symplicity: Say black ignores it. If white tries to escape at , is enough to seal it in. If white tries to make a base at , the long knight's move at removes essentially all of the eyespace. Since Black has no major cuts or weaknesses to worry about, so I don't see anything white can do. nakedjazz sees the threat to his center and blocks with , while I continue with the invasion. I have a lovely spread of white stones that has every promise of life, though at the cost of little to no influence towards that center. I'm fairly satisfied with this result, but I wonder if I could have invaded differently, and retained influence to the middle... Comments? Ideas? symplicity: I know you played as white, but if you put yourself in black's place, this position could actually serve as a good case study in killing much-too-deep invasions, if you're interested =). 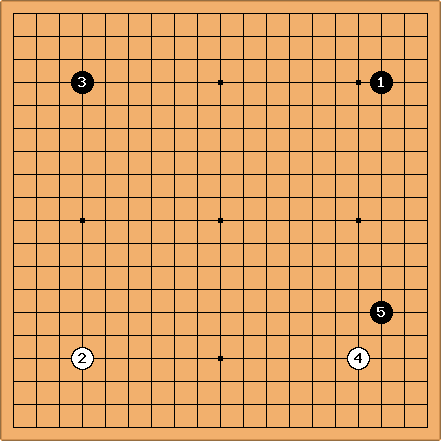 Note black's weakness-free massive walls on both sides. That's a good sign that black should be able to kill this invasion. 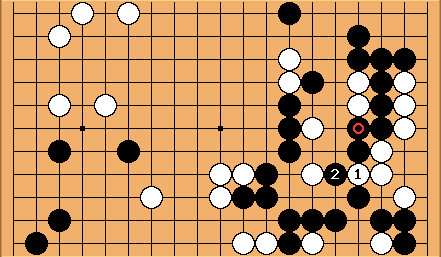 So (assuming you aren't confident enough to play tenuki), how should black do it? There's no need for black to start playing crazy contact moves like . These only complicate things and help white establish a base. Instead, the easiest way is often is a peaceful, seemingly lazy attack. Focus on 3 things: protect your weaknesses, stop the escape, and remove the base/eyes. Black has no weaknesses or cutting points, so we can check that one off for now. It would take several moves for white to escape all the way out, on pretty much all of the circled points. So we don't need to worry about escape much yet. So let's remove any hope for white getting a base. We can do that with a move like . It may even be too passive, but it is simple, gives white no chance to complicate. 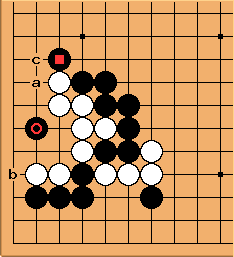 If white blocks at a, black has no weaknesses still, so he can simply hop in from the other side at b or c and again white has no base. If white plays c or d, black plays the simplest possible move to deny any base, a slide at e.
Following the game sequence, is still fine for black. But now, there is no need to play a reckless contact move ( at a) as in the game. White definitely can't escape now, so just deny a base. For instance, is fine, or if you aren't confident enough that you can connect up with the right, b or c are also perfectly fine. Even blocking at d works. Around a is the edge of this very territorial moyo, and the only real safe place to play keshi. Unfortunately for white, black's gains in this game seem too great to overcome if black plays solidly. As a more general response to your thoughts about the keima, is a move that seeks a base, ie tries to find some eyespace and more area to live in. You're right, the keima from the fourth to the third line, or the third to the second, is a good way to look around for the base, especially when it is a slide underneath an enemy stone. You will see this type of move frequently in many situations, not just deep invasions. 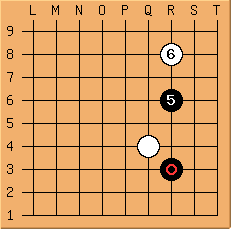 For a simple example, take a look at perhaps the simplest joseki. 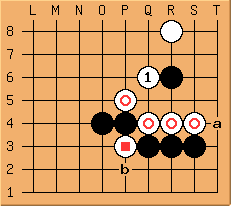 Both black and white make keima extensions in this joseki, each looking for a base more than territory. The keima is a good starting point when your stone starts feeling a little cramped, in need of some settled space to live. Don't consider it an iron rule, though (or anything else in this game! =) ), as sometimes you are left with an ugly angle play that does more harm than good. Oryx: Ask and you shall receive! See the subpage An Interesting Upper Left! Thad: It is very important to know The Difference Between Your Opponent Losing And Your Winning. Perhaps someone can use this as an example of how to handle such swindles, so that those of us ( everyone? ) who have had a large moyo reduced to rubble can avoid such in the future. In strumming through the Recent Changes, I chanced upon an interesting looking page title, Benjamin Teuber's "Guide To Become Strong". Clicking the link, I was immediately reminded of one of the very few things I actually REMEMBER from my Korean Sensei, waaaaaay back before most of you were even a gleam in your parents' eyes. "You want to be strong? You play, play, and play -- and when not play, tsumego, tsumego, tsumego. Learn what life & death is: then you live. Learn what fighting is -- then who knows," he would chuckle with a smile, loading that advice with all the double-entendre of a Korean Professor of Philosophy. So this is a really short Jotting... Benjamin Teuber explains it well on his page, so if you doubt ME, and you doubt my Korean sensei, go look there! ... but unless we've been SHOWN it, no, we DON'T just see it. I am not embarrassed by my lack of skill or knowledge - I know I will grow in both and in rank. Bear in mind, though, these Jottings are a view into my own personal patch of how I'm doing that, and that before I had the wonderful assistance and generous time from you, ThaddeusOlczyk, and Bill, and Rich, and Lynx (whom I haven't seen in ages on KGS), and even (or especially) "Visiting Reader", just to name a few of the contributors here, I would never have learned just how to view this combination. One good thing about this being my own home page, is that I take care of such things as typos and missing hyperlinks quietly as I get around to it. I am overjoyed that my Jottings have attracted so many bright and valued comments, and words cannot express how much I appreciate the input and guidance. I am a bit chagrined that "Visiting Reader" was bashful and didn't choose to leave his/her KGS nick, but that does not detract from the validity of their comment.